After all this work, you'll want to protect the rubber stamp from damage. At the very least, wrap it in something like a heavy cloth, felt, fleece, or a folded paper towel. Ideally, find a protective rigid container for it. With a rubber stamp, you normally only have one color to work with. However, there are a couple of other ideas to consider. You can buy "Cat's Eye" or "Dew Drop" ink pads in various colors, and use the pointed end of the pads to apply colors to selective areas of the rubber stamp before stamping. You can do the same thing with Marvy Brush Markers. 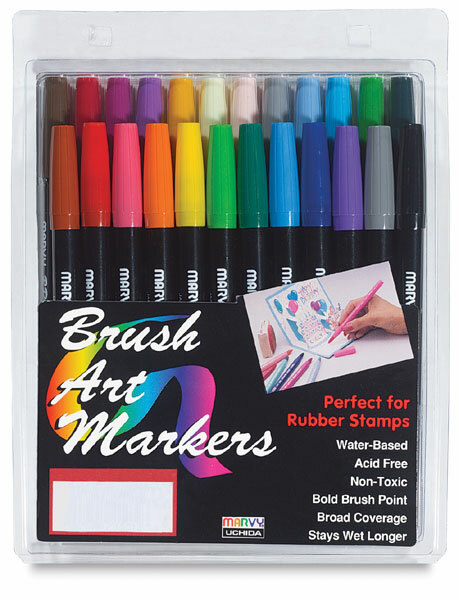 Marvy Brush Markers are available in something like 108 colors, including several different collections of 12 markers as well as the 24-marker collection shown. If you provide the Cat's Eye or Dew Drop ink pads or Marvy markers in your letterbox and include an image in the log book showing what it should look like, the finder should be able to follow your lead. This obviously requires more time and patience on the finder's part, but if you're creating a nifty multicolor image, he won't mind. The time involved can lead to another problem: the ink is drying out faster than you can apply it. The solution is a practice called "huffing", wherein you cup your hands around the stamp and exhale gently on it. You can see the ink regaining its wet look as you do it. You can take the multicolor idea to the next level and provide multiple rubber stamps that work together to make a single multicolor image. With these, it helps to provide some method of properly aligning the multiple stampings. The simplest is to make each stamp's backing exactly the same shape and size and suggest the finder place marks on the paper to align the stamp against prior to stamping. As long as you're making multiple rubber stamps, you might as well hide them in separate letterboxes and make the finder work to assemble the image. Opposite ends of the Appalachian Trail would be especially heinous. Perhaps even more popular is the "stamp-and-color" idea. A single color -- usually black -- is used with the rubber stamp to make an image, and then the image is used like a coloring book; you color it in. You can leave colored highlighters or colored pencils in the letterbox with the stamp (crayons are not recommended, as they will melt). In the log book, show what the colored image should look like. You can buy really tiny highlighters that won't take up much room inside the letterbox. Remember that if you use pencils it's a good idea to leave a sharpener in the letterbox. And it's a good idea to seal the sharpener in its own tiny little airtight baggie to help keep the blade from rusting. Although some people carve their own rubber stamps as a hobby in itself, or as an art form, perhaps the most popular reason to be carving rubber stamps today is letterboxing. You can investigate this pastime at www.AtlasQuest.com. There is a season for everything. I live in Florida, and I don't go letterboxing in the summer; it's either raining or it's too hot and buggy outside to be enjoyable. So I stay home and carve rubber stamps in air-conditioned comfort. By the time fall rolls around, I've assembled a good selection of rubber stamps to go hide! You might decide to take a similar tack towards placing your first letterbox. Instead of just carving one rubber stamp and going out and placing it, you could opt to carve a half dozen before you place the first one. At that point, you'll have a pretty good idea what it takes to make a really nice one and whether or not you want to place all those you've already made or whether you'd prefer to toss a couple of them and perhaps do them over. Once your rubber stamp is ready you can move on to Creating a Letterbox. If you have any comments or suggestions, please write me at "palmk at nettally dot com". Be sure to use words like "rubber stamp" in the Subject: line so I don't delete your message as spam. Alternatively, you can visit http://www.letterboxing.org or http://www.AtlasQuest.com and use the "contact the placer" function to drop me a line; I'm registered as "Kirbert" on both sites. If you'd like to get into letterboxing but are incapable of carving rubber stamps -- eyesight too poor, shaky hands, whatever -- there is a "Stamp Swap" board on AtlasQuest that is intended to put people who don't carve in touch with people who carve more stamps than they can use. Despite the misleading title, you don't really need to have a stamp to trade to get another stamp; you can just ask to find out who might be willing to simply send you a stamp for planting. Don't forget to mention what you want it for; some carvers will provide stamps for planting in letterboxes but are less interested in other uses.